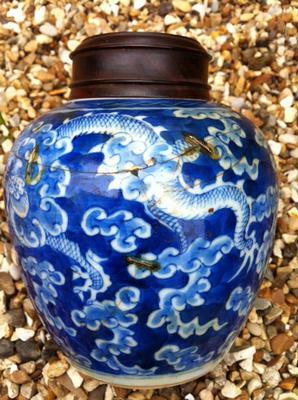 This is the third of my Chinese jars. This one measures 13 and a bit cms high including the wooden lid which itself is just over 6cms in diameter. 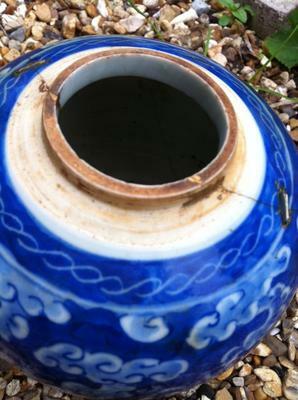 There are 6 staples in the pot which has obviously been in a tragic accident at some stage of its life. I quire like that as to me it has a hidden story. Can you tell me anything about it such as age or pattern? I love the fact it still has a beautiful lid. 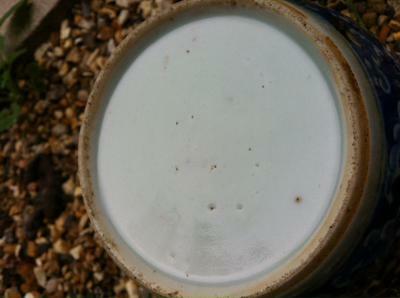 The base has no marks that I can see just a whole bunch of dimples in the porcelain. I'll post another couple pic with the staples. 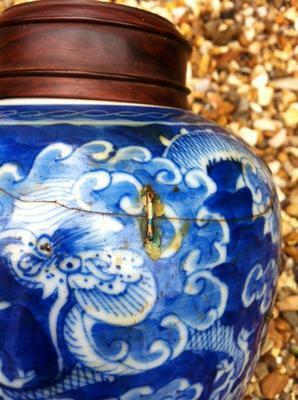 Comments for 6 old staples in this Chinese vase, what age is it? Hi. I've had this valued via an online company. They suggest it's 19c with a 20th c repair and valued at 200 -300 GBP. They say professional repair may increase value. Anyone any idea what costs might be involved in repairs of this nature? Thank you very much Peter for your comments. Most helpful. Hi Peter. What sort of age do you think it is. 19C ? Late Qing dynasty. That means usually about Daoguang reign to Guangxu. This from the appearance of the dragons tail and scales which changed over time. It is impossible to tell more exactly. Excellent specimen of a ginger jar. 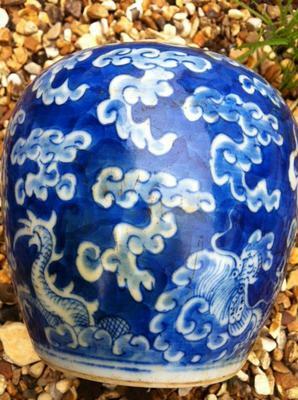 I don't see that much ginger jar decorations with a dragon/clouds decoration white on blue. My personal view is that this is highly collectible despite the staples. Staple repairs are also considered age signs. Yes, nice replacement lid. Could be zitan, judging by the color. The lid itself has a also value, today, as the price of zitan wood has risen in recent years. Here are a couple more pics of the staples in the pot.